Quick and easy to make, shrimps are a great option to sizzle up your appetite. 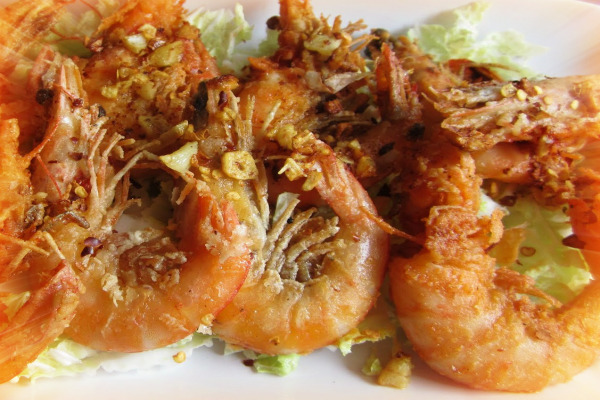 Shrimps are rich in proteins and have abundant nutritional value and health benefits. Known to be a healthier food option than meat and beef, shrimps have become the favourite party food option for people who love their food and also like to check their calories. 1. In a bowl, combine cornstarch, rice flour, garlic powder, onion powder, Oriental five spice, salt and pepper. 2. Clean (take out the whiskers), rinse and pat dry shrimps. Put shrimps in the flour mixture. Shake shrimp until well coated with flour mixture. 3. Heat oil in a frying pan/heavy bottomed skillet. Fry shrimps in batches to achieve crispy shrimp, (over crowding will give you soggy shrimps). Drain on paper towel and set aside. 4. On a small pan, melt butter then fry garlic, cook until garlic turns brown but not burned. Remove fried garlic. 5. Using the same pan quickly saute' the sliced cabbage until it starts to wilt but not over cooked. Cabbage must still have the crisp. 6. Arrange cabbage on a large plate. Set shrimps on a bed of cabbage. 7. Garnish with fried garlic and pepper flakes.